Fire protection has become an important issue in the industrial and business environment. Fire is expensive: damage to business through fire is usually lengthy, costly and can eventually lead to insolvency . 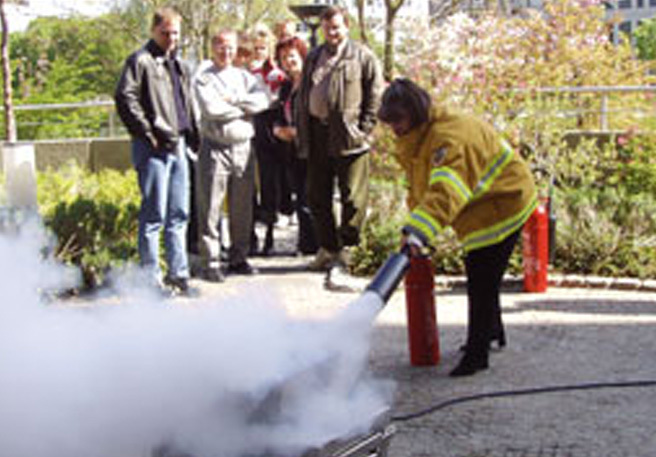 We train your entire staff on fire protection and defence, making them aware of the dangers of fire. This course of action will make your staff aware of the dangers of fire, giving them the opportunity to learn how to extinguish fires and minimise the related damage. Employees will learn how to extinguish a fire during a practical hands-on training. Not to worry, there will be no damage caused – your fire protection engineer is on hand and ready to act. We bring all relevant material (Fire Trainer) and extinguishers for the fire protection training. Training is on your premises, allowing us to go into detail on your company specific fire related issues. No staff travel expenses occur.